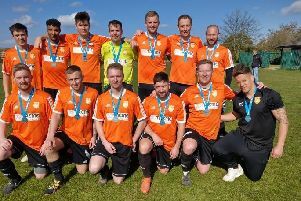 Huntingdon footballer Gary Marheineke will be playing for England in Poland this weekend (June 24/25) with a helping hand from Mick George Ltd.
Marheineke plays in goal for the England Amputee XI, who are in action in Warsaw in the Poland Amputee FA Invitational Cup on Saturday and Sunday. Marheineke has alkso been selected to play for his country in the 2017 EAFF European Championships in Turkey in October. The cost to attend those tournaments is £1,500 and Mick George Ltd have donated £500 to the cause. To help support the athletes, visit: www.everyclick.com/amputeefootball. Marheineke is no stranger to the international scene, He has represented Great Britain in major European competitions in the past, having played in the World Cup of amputee football back in 2014 when the GB side bowed out in the knockout stages in Mexico.